Although an enzyme called pepsin begins to digest protein molecules while they are in our stomach, most of the digestion of protein takes place after the food leaves the stomach and moves into the small intestines. Here enzymes like trypsin, chymotrypsin, elastase, carboxypeptidase, and aminopeptidase convert protein molecules into amino acids, dipeptides, and tripeptides. The dipeptides and tripeptides are converted to amino acids by other enzymes. Once the amino acids are free, they can move into the blood stream and circulate throughout our body. In all forms of digestion (whether of proteins, carbohydrates, or fats), larger molecules are broken down into smaller molecules by a reaction with water in which a water molecule is split in two, with each part joining a different product molecule. This type of reaction is called hydrolysis. Remember that proteins are long chains of amino acids linked together by amide functional groups called peptide bonds. When protein molecules are digested, a series of hydrolysis reactions convert them into separate amino acids. In the laboratory, the reaction above is very slow unless a strong acid catalyst is added to mixture, yet in the small intestines, where the conditions are essentially neutral rather than acidic, most of the hydrolysis of proteins takes place rather quickly. The reason, as we have seen, is the presence of enzymes. 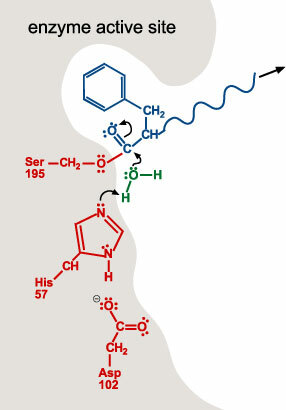 To get a general idea of how enzymes do their work, let’s look at a proposed mechanism for the hydrolysis of peptide bonds in protein molecules as mediated the enzyme chymotrypsin. 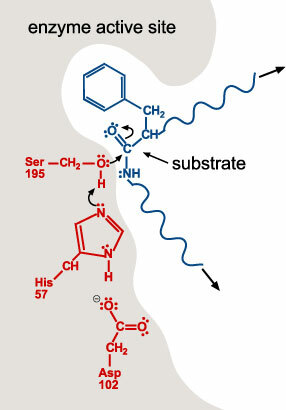 For an enzyme-mediated reaction to take place, the reacting molecule or molecules, called substrates, must fit into a specific section of the enzyme’s structure called the active site. Each active site has (1) a shape that fits a specific substrate or substrates only, (2) side chains that attract the enzyme’s particular substrate(s) and (3) side chains specifically positioned to speed the reaction. Therefore, each enzyme will only act on a specific molecule or a specific type of molecule, and in a specific way. 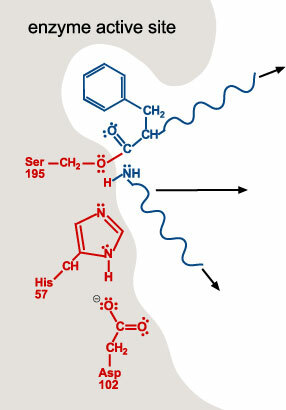 For example, chymotrypsin’s one enzymatic function is to accelerate the breaking of peptide bonds that link an amino acid that has a nonpolar side chain, like phenylalanine, to another amino acid on the interior of polypeptide chains. The images to the right describe a proposed mechanism for the hydrolysis of peptide bonds by chymotrypsin. Each arrow in the figure represents the movement of two electrons (and the consequent making or breaking of a bond). Stage 1: A polypeptide substrate moves into the active site of the enzyme. 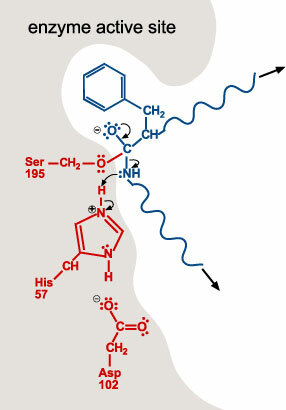 The shape, size, and amino acid sequence of chymotrypsin’s active site allow that part of the enzyme to bind a portion of a polypeptide that has nonpolar side chains, like those found in phenylalanine. Once the polypeptide is in the active site, an H+ ion moves from the serine amino acid at position 195 (Ser-195) of the enzyme’s amino acid sequence to the histidine amino acid at position 57 (His-57). The oxygen atom in serine’s hydroxyl group then forms a covalent bond to the carbon of one of the substrate’s peptide bonds shifting the two electrons from one of the double bonds up to form a lone pair. Stage 2: The plus charge formed on His-57 is stabilized by the negative charge on the aspartic acid at position 102 (Asp-102). When the double bond is reformed carbon and oxygen in the peptide bond, the bond between the carbon and the nitrogen in the peptide bond is broken. The nitrogen-containing group is stabilized by the formation of a bond to a hydrogen atom from His-57. Stage 3: The portion of the polypeptide that contains the nitrogen atom from the broken peptide bond moves out of the active site. Stage 4: A water molecule moves into the active site. The oxygen atom in the water molecule loses an H+ ion to a nitrogen atom on His-57. This allows water’s oxygen atom to form a bond to the carbon atom the remaining portion of the substrate. Like in stage 1, one of the bonds in the double bond shifts up to form a lone pair. Stage 5: When the double bond is reformed, the bond between carbon and the oxygen of Ser-195 is broken. The –OH group on Ser-195 is restored with a transfer of an H+ ion from His-57. With this step, the Ser-195 and His-57 are both returned to their original forms. Stage 6: The remaining portion of the substrate moves out of the active site, leaving the active site in its original form, ready to repeat stages 1-5 with another polypeptide molecule.